Now Archived! PolarConnect event with Jenn Baldacci and "Team Squirrel" from Toolik Field Station in Alaska. You can access this and other events on the PolarConnect Archives webpage. 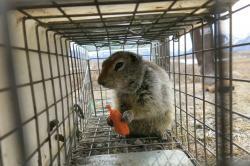 An Arctic ground squirrel eating a carrot in a cage. Photo by Andre Wille. The climate of the Arctic is extreme and characterized by long dark cold winters and short bright cool summers. Arctic ground squirrels avoid the long winters by spending 7-9 months below-ground hibernating, reaching body temperatures as low as -3°C as they supercool their tissues. But the onset of spring in the Arctic can be variable depending on the depth of the winter snowpack that needs to melt and the prevalence of late spring snowstorms. How do arctic ground squirrels know when to terminate hibernation and emerge to the surface? Predicting how species might alter their annual timing in response to rapid environmental change, including climate change, is constrained by insufficient knowledge of the endogenous mechanisms animals use to keep time, the cues used to adjust timing, and the extent to which programmed seasonal cycles are physiologically plastic. This study will investigate the mechanisms that underlie plasticity in the seasonal induction of the neuroendocrine signals that trigger the termination of hibernation and onset of reproduction in ground squirrels. 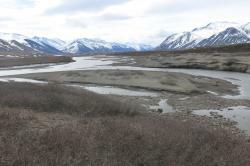 A view of the Brooks Range near Toolik Lake, Alaska. Photo by Andre Wille. From Fairbanks, Alaska the team will embark on an eight hour drive to Toolik Field Station, located in the northern foothills of the Brooks Range in northern Alaska. Toolik Field Station is operated by the Institute of Arctic Biology at the University of Alaska Fairbanks and has hosted hundreds of researchers and students every year since 1975. The team's research sites around the Toolik Lake area will be accessed by pick-up truck or on foot. Hey, Mrs. Bault! I hope you are having fun down there. We miss you! Be safe! Thanks Adeena. It was a really great season to be there and see it happening. So much beauty..and so much water! Re: Adeena Teres commented on 17 April 2017 Eat this. And this. Work hard, play hard. If I stayed here, I would really have to limit myself.